Rhode Island home care providers can attest to the fact that living a sedentary lifestyle during the golden years of retirement does not appeal to all seniors. Tens of thousands in the United States and all over the world continue to celebrate life by maintaining physical health as seasoned athletes. Eugster makes fitness a priority and as a result, he proudly displays a physical build more commonly seen on men decades younger than his 97 years. The senior athlete gained fame for being the fastest sprinter in the 95+ category. He also established a new world record for the 200-meter dash. Winter decided that it was time to get serious about fitness after turning 70. He attributes his health to diet and exercise. The 101-year old’s daily workout regimen includes 100 push-ups. 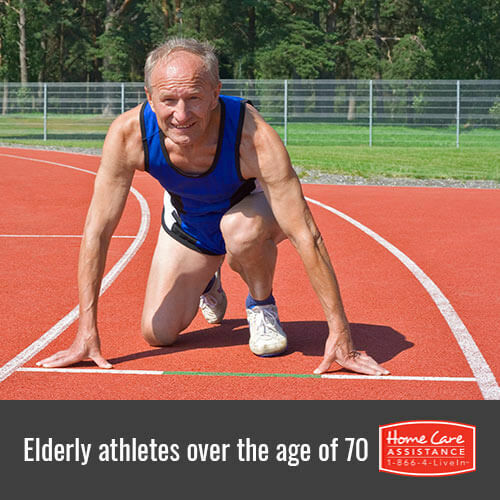 The gold-medal winning athlete loves running and was the oldest U.S. Senior Games competitor to run the 100-meter dash. Bach possesses gold medals for the 50-meter, the 100-meter, the 200-meter and the 400-meter races. A bout with cancer while in his 80s did not permanently keep the now 96-year-old racer from competing in track and field events. Miyazaki enjoys recognition as being the oldest sprinter in the world. The Japanese athlete did not start running until he passed the age of 90. In 2015, at the age of 105, Miyazaki successfully completed the 100-meter dash in 42.2 seconds. Displaying amazing control and elegance at 90 years of age, Quaas is the oldest gymnast on the planet. The retired physical education teacher believed that getting older was not a good enough reason to give up gymnastics. Along with practicing twice a week, she enjoys swimming or walking for at least one hour each day. At 99, the decorated WWII hero is an accomplished swimmer. Witte entered his first competition in the National Senior Games in 1987. He has since inspired his 62 and 58-year-old sons to join him in competing. Exercise and healthy diet are key components of maintaining physical and emotional wellness during the golden years. That’s why Home Care Assistance encourages seniors to maintain nutritious diet and exercise regimens as part of a balanced lifestyle. We provide flexible live-in, hourly, and respite Rhode Island home care that helps seniors prepare healthy meals, maintain physical activity, and continue to socialize with friends and family. Call us today at (401) 284-0979 to learn more about how our services will benefit your loved one.